A local historian, in Rochester, NY, muses about family history, and life in the 19th and 20th centuries, and urban living, and music, and musicians. Her relatives, the musical Dossenbachs, alive in Rochester from the 1870s till the 1940s, will guide the way through this travelogue into the past. It is a glorious October 25th, in the year of 2017, and we -- all of us now reading this -- are alive! Someday in years hence, when we are no longer here, there just might be someone we don't know reading these words, and remembering us. It is a comfort, to be sure, this business of believing in remembrance. 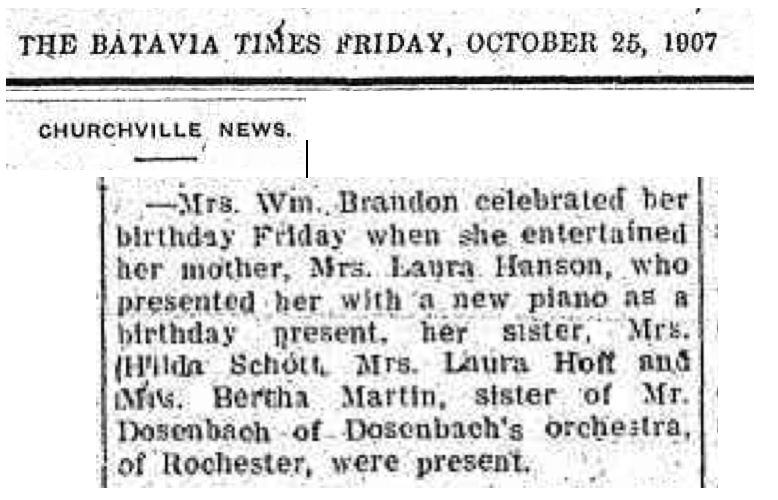 I woke up this morning with the Musical Dossenbachs on my mind, my great-granduncle Hermann (brother to my great-grandfather Theodore), and their sister Bertha, and of course Otto, the oldest brother, the child performer. They weren't so very different from us -- they woke up on various October 25ths, and felt the crispness of Fall and noticed the brilliant colors, accompanied by the memory of a summer now past. 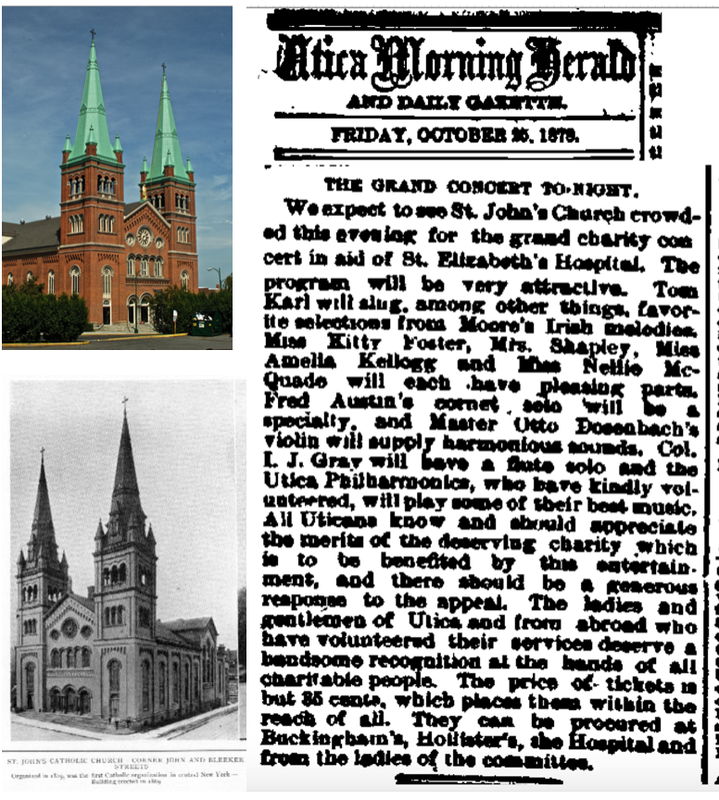 In the year of 1878, Otto Dossenbach awoke on October 25, and probably had music on his mind as he was scheduled to perform that night at a grand concert for Utica's St. Elizabeth Hospital, which had been founded only 12 years earlier, in 1866. It was the first hospital in Oneida County. and so they were trying to do something new and important and bold. 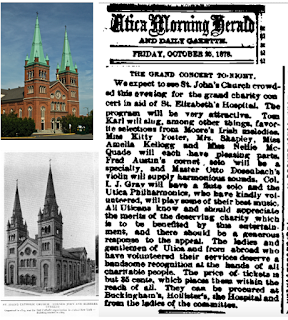 After paying 35 cents for their ticket, over 1000 people attended this charity performance at St John's Church, a magnificent building which still stands today. Concertgoers heard Irish melodies and a cornet solo and a flute solo. But most exciting was the performance of the Utica Philharmonics orchestra, led by the youthful Otto Dossenbach. In 1878, Otto was 18 years old. He was known as "Rochester's wonderful boy violinist," and for the previous 5 years, he had been touring all over New York State and also Indianapolis, Cincinnati, and St Louis. The previous August, he had become the leader of the Utica Philharmonics orchestra, and on this night, they "surprised even the most enthusiastic admirers." "The Philharmonics never did better than on this occasion, and they give promise of still better efforts." But it was Otto himself who stole the show. "The large audience had quite a revelation in Otto Dossenbach's remarkable violin solos. He gave one of Mozart's souvenirs, and received the heartiest applause of the evening. This was acknowledged by the Carnival of Venice, and still his hearers were not content, so another admirably executed air was given in fine style. There was some peculiar charm in his instrument last evening, and the young gentleman never handled his bow with such good effect. Utica is proud to claim Otto Dossenbach as one of its citizens and the leader of its best orchestra." Otto would spend a few years in Utica, and then tour again until his career was tragically cut short in 1889, but that's another story. 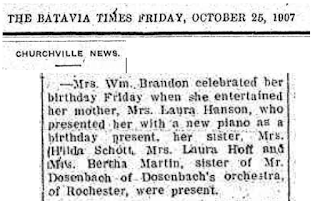 Moving ahead in time, to the year of 1907, Otto's youngest sister Bertha celebrated a friend's birthday in Churchille on October 25th. The friend was given a new piano for her birthday present. Pianos were popular back then. It was common for friends and family to play music together, and sing together, in their parlors, as this was a time before recorded music (the phonograph was still new and not everyone had one) or radio or television. Keeping up with the relentless forward movement of time, in 1943, Otto's younger brother and Bertha's older brother, Hermann, directed the Damascus Temple Band on October 25 -- it was Shrine night and the circus was in town! 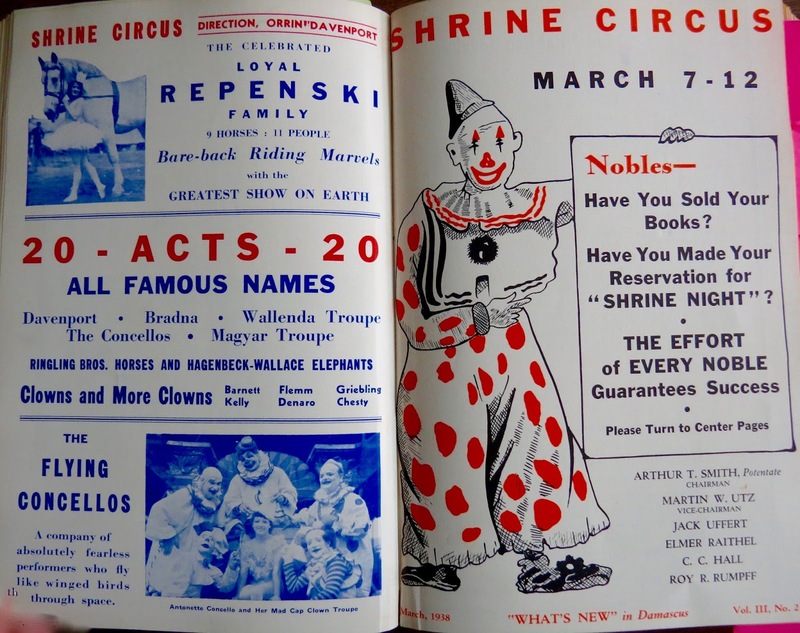 Tonight's performance was solely for the orphans and the underprivileged children, who were the first to witness the "daring aerial feats" and the wild animals, and "to eat to their hearts' content of peanuts and popcorn, and fluffy pink candy." Their hearts' content! What a beautiful sentiment. OCTOBER 25 -- always a grand and glorious day. What will you make of your day today?